Expeditions this year include also NOAA's Deepwater Exploration of the Marianas Trench – a 59-day voyage with 22 dives into the planet's deepest known canyons in the Pacific Ocean near Guam. NOAA explorers added three new hydrothermal vents to the world's inventory and a new high-temperature "black smoker" vent field composed of chimneys up to 30 meters tall – the height of a nine-story building. Ocean exploration has arrived at a historic hinge, Forum organizers say, with profound transformation underway thanks to new technologies, led by increasingly affordable "roboats" – autonomous or remotely controlled vehicles that dive into the ocean or ply the surface laden with sensors collecting information from instruments suspended beneath them. The technologies will not only help discover and monitor new mineral and living resources, they could help secure interests vital to the world's economy or identify the best paths for communications cables that span the ocean floor – the veins of the Internet. Forum participants such as John Kreider of Oceaneering International envision such ships in future serving as hives from which flotillas and squadrons of autonomous underwater, surface and aerial vehicles are launched – robots guided by experts on board or remotely, such as from a distant university campus via "telepresence," returning with images and data orders of magnitude larger than ever before. Better understanding the food chain – monitoring the distribution and abundance of marine life, finding species new-to-science, and detecting invasive or endangered species. Says scientist James (Jamie) A. Austin, Jr. of the University of Texas, "the slow, time consuming and expensive way we've done ocean exploration forever – one ship doing one task at a time – is giving way to autonomous systems that net massive hauls of data, with advances in big data analysis enabling scientists to make sense of it rapidly." Dr. Austin envisions installations on the seafloor – measuring tremors or helping scientists estimate the rate at which Earth swallows carbon into its mantle through plate tectonics, for example – with data delivered by a device periodically flying up and down to the surface. At an estimated cost of $2.9 billion – or about $9 per square kilometer ($23 per square mile) – a "Gurgle Earth" map of the deep oceans could be completed at high resolution using swath like, multi-beam sonar. With documentation of the continental shelf, America's Exclusive Economic Zone, 11.3 million square km in size today, could extend a further 2.2 million square km – a 20% enlargement, representing an underwater area larger than Alaska. (See http://bit.ly/2cTU7lG). Other recent finds of ancient shipwrecks and even ancient human remains, he adds, reveal that early mariners didn't simply hug the coastline but sailed courageously great distances from shore, and make it possible to determine who they were. While these and countless biological discoveries represent things discovered underwater, the intent of future exploration campaigns include measuring more, sampling more, and better understanding physical, geological and living processes – knowledge of vital importance for security, responsible ocean use and sustainable resource management. Asked what he thought might yet be discovered underwater, Dr. Ballard compares that to asking Lewis or Clark what they thought they'd find on their historic traverse of America. The reply, he says, would have been "I don't know. I'm getting into a canoe and I'm going to paddle." In one of several papers written for the Forum, meanwhile, U.S. Ambassador Cameron Hume adds that, beyond exploring and the initial characterization of an ocean area, humanity also needs to pursue subsequent research and long-term observing. In his paper, Dr. Jerry Schubel of the Aquarium of the Pacific, lamenting the relatively low level of public attention accorded to ocean exploration, points to new opportunities for awareness raising created by social media. "Understanding life on other planets," he says, "may help us understand the origins of life in the universe, but it can't match the relevance and importance of ocean exploration to the future of life on this planet." 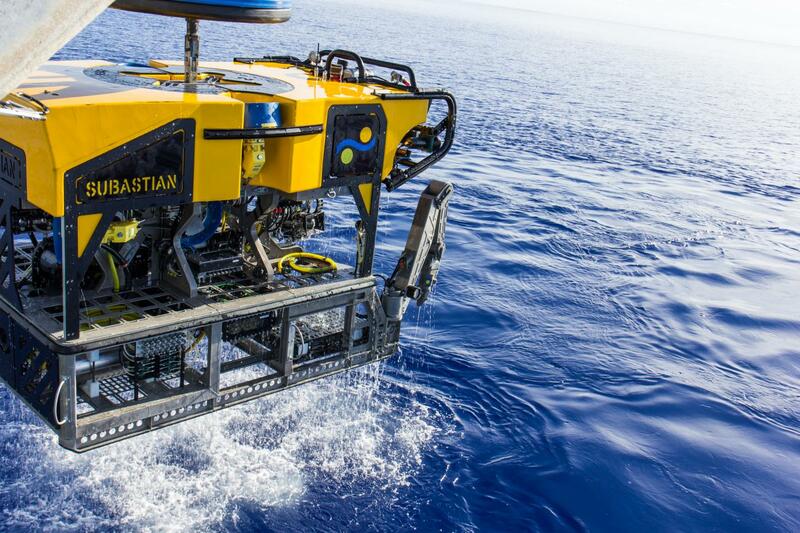 Says organizer Prof. Jesse Ausubel, faculty member at The Rockefeller University: "SuBastian and the Roboats sounds like a rock band, but it is the future of ocean exploration. One million marine species and one million shipwrecks may remain to be discovered. Let's use new approaches to multiply exploration." Says Forum organizer Vice Admiral Paul Gaffney, former President of Monmouth University and Urban Coast Institute Ocean Policy Fellow: "America is the greatest maritime nation in the history of the world, yet we scarcely know submerged America and only about 10% of the global oceans. At this Forum, we are encouraging ocean technology leaders to join the discussion and support more comprehensive exploration campaigns indispensable for sustainable use of the oceans and inspiring ocean stewardship." The ultimate aim: to formulate compelling, feasible campaigns to be carried out by the participants in the 2020-2025 timeframe. At the Forum, Dr. Jyotika Virmani will share the roster of teams for the $7 million Shell Ocean Discovery XPRIZE, a global competition to promote unmanned ocean exploration. NAS President: new technologies can open "citizen science era of ocean exploration"
In a letter to the Forum (in full: http://bit.ly/2dA7uqT), the President of the US National Academy of Sciences, famed ocean explorer Marcia McNutt, says "a number of events have underscored how essential our mission is to vastly improve knowledge of the marine environment." Inadequate knowledge of ocean terrain and currents hampered the search for flight MH 370 in 2014, for example. CubeSats, she notes, have "'democratized' space, providing access for pennies on the dollar. Similarly, new commercial tools, although still in their infancy, hold the promise of ushering in the citizen science era of ocean exploration." "The task we face is simply too large to continue to use 20th century tools if we hope to make a dent in the problem." 2016 National Ocean Exploration Forum, "Beyond the Ships: 2020-2025"
Venue: The Rockefeller University, 1230 York Ave, New York, NY. Supporters: the Monmouth-Rockefeller Marine Science and Policy Initiative, NOAA, the Schmidt Ocean Institute, and James A. Austin, Jr. The Forum is the latest in a series mandated by Congress (Title XII of Public Law 111-11) in March 2009 when it officially established the NOAA ocean exploration program. This law requires NOAA to consult with the other federal agencies involved in ocean exploration, as well as external stakeholders, to establish a "coordinated national ocean exploration program" that promotes data management and sharing, public understanding, and technology development and transfer. The law also requires NOAA to organize an "ocean exploration Forum to encourage partnerships and promote collaboration among experts and other stakeholders to enhance the scientific and technical expertise and relevance of the national program." The 2016 Forum convenes approximately 100 experts from academia, government, and the private sector to discuss adaptation and integration of technologies that can be employed in ocean exploration campaigns in the 2020-2025 timeframe. The Forum will look to a future of expanded exploration activities by making more platforms capable of measuring, sampling, or imaging yet-to-be-explored areas – employing a suite of technologies that have been dubbed "flyaway systems." Expanding spatial coverage and reducing cost of data collection are key ocean exploration priorities over a ~10 year time horizon. These priorities can be realized by creatively adapting and assembling existing technologies, and deploying them onboard autonomous devices, buoys, various so-called ships-of-opportunity, and other platforms, in addition to the existing fleet of dedicated ocean exploration vessels. The Forum will help federal funding agencies and foundations define and prioritize exploration technology investment options for 2020-2030, and stimulate a vision among leading explorers of what it might be like to conduct expeditions in this time frame. Telepresence (real time and non-synchronous) including, but not limited to, discussion of "fly away" possibilities and the impact of the proliferation of IT/visualization technology among the public — from smart phones to virtual reality. Also related systems for integration/command-and-control. Invitees represent the academic, government, non-profit, and for-profit communities, with expertise in both the engineering aspects of creating relevant equipment, and in exploratory and scientific applications of such equipment. Beyond the Ships: 2020-2025 is the first of four annual Marine Science & Policy Series conferences that will be organized by Rockefeller and Monmouth, with events taking place on alternating campuses in New York City and West Long Branch, New Jersey.